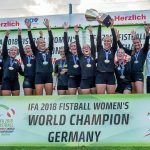 Are you a team player and motivated to be part of the biggest Fistball Women’s World Championship in order to make the event a successful big event? Then you are exactly right here, become member of our Volunteer-Community. Our team gives their all to make the IFA 2018 Women’s World Championship in Linz a success….